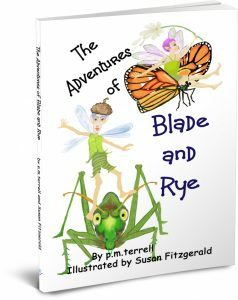 In p.m.terrell’s first children’s book, two little fairies named Blade and Rye discover Planet Earth. They talk their teacher, Miss Indigo, into allowing them to stay but first they must find the perfect place. They travel from the highest mountain to the depths of the ocean and discover things about the planet. And to keep them safe from wandering into danger, Miss Indigo turns them into two blades of grass that can hide in plain sight and watch the world around them. Written in a fun rhyming prose and illustrated beautifully, The Adventures of Blade and Rye is sure to become a favorite. This book will be available in all eBook formats and in paperback, 7x10 inches and 44 pages. Full color interior. For Library and Book Store Discounts, contact the Publisher, Drake Valley Press.